My popular writing career began with New Scientist, a weekly scientific magazine in the UK. I started writing for New Scientist while still a lecturer at King's College London. I have always been keen to explore specific chemistry related topics in detail, and understand the true impact these chemicals have made on all our lives. The publications I write for diverse and range from technical to popular. I have written many feature articles and book reviews for New Scientist. A few favourites are included, with some additional commentary. My most high-profile work was for the newspaper The Independent. My Molecule of the Month piece ran from October 1990 to November 1996. I have linked to all the pieces available on the Independent website. Right now I'm Wired's chemist, providing readers with a deconstruction of everyday products. I've included my original content on my Wired page. My Wired pieces have all appeared under the 'What's inside...' feature. I provide interesting facts about all the chemicals that are used in everyday products. I have a regular column called Hitchhiker's Guide to the Elements in Education in Chemistry. 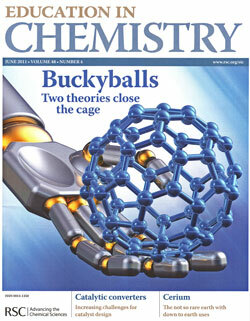 This free magazine is published six times a year and sent to chemistry teachers by the Royal Society of Chemistry. My column takes an element from the periodic table and focuses on aspects that I find particularly interesting. The object is to provide information that you don't generally find in a text book but which might be used by chemistry teachers to surprise their pupils. Here are the articles as I submitted them to the magazine, slightly longer than when they were published. I helped write the booklet Making Sense of Chemical Stories which was published in January 2009 (and is available on their website) and was written as a briefing document for the lifestyle sector which is prone to misconceptions about chemicals. I have provided statements that give the correct scientific explanation of concepts which are commonly used, such as food additives, or misunderstood. I have been asked to comment on the silly statements which celebrities are prone to make and who clearly don't know what they are talking about. Sense About Science gathers these throughout the year and then refutes them at the start of the New Year. Here is a link to my articles in Science Watch. These provide succinct information about what's hot in current research.